Files is your personal file storage space in Populi. You can use it to store and organize your files, share files with other people at your school, and access files that others have shared with you. Inbox: When other Populi users send you files, you'll find them here. Files: Here is where you'll find all of your own files and folders. Shared: If you've shared any folders, or any have been shared with you, you'll see them all here. Search: Search for individual files and folders (whether your own or those that have been sent/shared with you). Trash: A list of files and folders you've deleted. You can move them out of trash or permanently delete them. Drag-and-drop the file or files you're after into the upload area. You can also search for files on your computer. Upload as many files at a time as you wish. When you're done, click... um, Done. Click the file to view it within the Populi file viewer. It lets you watch videos, listen to audio, and view images and documents. In the file viewer, click to download, rename, send, or trash the file. Type names to find the person you want to send the file to. If you want to send it to multiple people, repeat this step as often as you need to. Check if you wish to email any of the recipients. After sending the file, it will appear in all of the recipients' Files Inboxes. In the main Files view (or in a subfolder), check next to each file you'd like to move. A number of options will appear at the top of the screen. Click Move. Click the folder to which you'd like to move the files. If that folder has subfolders, then choose the subfolder... 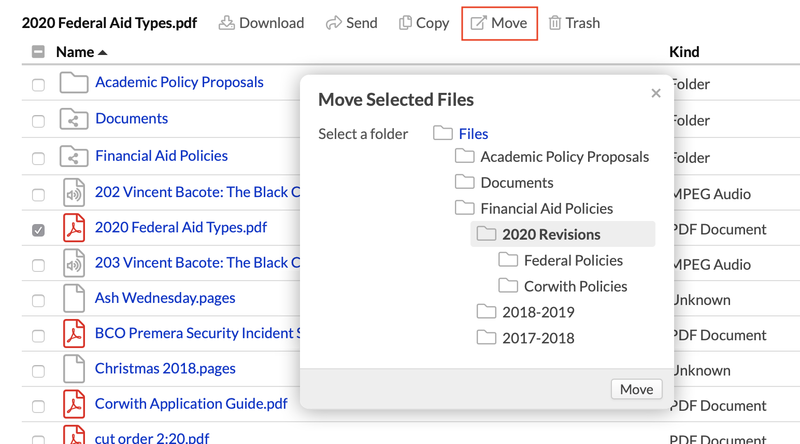 The files will be moved to the folder which is highlighted in gray. Folders let you organize your files. You can create folders within other folders (and more folders within those folders...). To create a folder, just click New Folder, give it a name, and Save. Click Share Folder. You can find this in the main files view next to the folder, or at the top of the screen when you're looking at a folder. Select the user role with whom you'd like to share the folder. You can also search for individual people. Can view: Users can read or download these files. Can edit: Users can also rename or delete these files. Can manage: Users can also share this folder with others. Repeat these steps for as many roles/people as you wish. Check if you wish to email invitations to these users. After sharing this folder, it will appear in the Shared view for everyone with whom it has been shared. Once a student graduates, can they still access the files that they uploaded to their inbox folder? Provided you let them retain their user account, then, yes! Is there a way to disable download of a shared file? E.g., for a video you want students to watch but not copy? I too would like to know how to disable download/copy of a shared file, or for that matter, anything I would post to a lesson in my course page. I have resources from a textbook that I can use on a private learning platform (like Populi) but only if the download and copy functions are disabled.